The UNH & Seacoast Chabad Jewish Center is a Home for Jewish Celebration and a Center for Jewish Education adjacent to UNH and the Seacoast of New Hampshire. 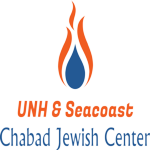 UNH & Seacoast Chabad Jewish Center is founded on the principle that while Jews embrace many levels of observance in their personal lives, there should be a place for all Jews with no labels or no affiliations. They develop a sense of community and enhance the experience of being Jewish. We have successfully catered to hundreds of students and families from all backgrounds, offering Jewish educational programming in an accepting and innovative setting where all feel welcome. Our goal is to create a positive Jewish experience for everyone as they strengthen their ties to the Jewish community. UNH & Seacoast Chabad Jewish Center is a place where every Jewish Student/Person is welcome - regardless of affiliation or level of knowledge. Our sole purpose is to create a warm welcoming environment to explore and experience our heritage in a non-judgmental and inviting atmosphere.